Each spring, medical students learn where they will train for their residencies on Match Day, and that annual event has led to the recognition of The University of Toledo’s Urology Program in The Journal of Urology. The article in the national publication titled “The Gatekeeper Disparity: Why Do Some Medical Schools Send More Students Into Urology?” covered the reasons behind the interest of students in urology at certain schools. UT was ranked fifth for matching 19 medical students in the specialty from 2005 to 2009. The University was on the list with prestigious medical schools, including Columbia, Baylor, Northwestern, the University of Michigan and the University of California at Los Angeles. On the most recent Match Day, held March 17, three students in the UT College of Medicine and Life Sciences were matched with urology residency programs. “I was pleasantly surprised to see the article and its recognition of our institution as one of the leaders in leading students into a career in urology,” said Dr. Steven Selman, professor and chair of urology, director of urological research, and director of the residency program. According to the article, the most prominent reasons for choosing the urology program at institutions include medical school faculty size and class size, a six-year versus five-year program length, and the important roles of the program director, chair and faculty members. The study shows that medical students want staff members who are supportive, charismatic, available, and have prominent reputations. “In my mind, faculty and residents dedicated to and enthusiastic about the clinical practice of urology surely are primary in influencing medical student career decisions,” Selman said. The UTMC Urology Program is a six-year program with six full-time academic faculty members, many of whom have been published many times, Selman said. The class size is limited to 12 residents in the program at one time, though the total class size at UTMC has grown. “I am extremely proud of my department’s residency and student education program and am equally proud of the national attention the journal’s article brings to the department and the College of Medicine,” Selman said. Senior Jessica Williams scored 15 points against UNC. It was a historic night in Savage Arena. A total of 7,020 fans were on their feet and watched their Toledo Rockets fly by the Charlotte 49ers, 83-60, to advance to the WNIT Championship game. Toledo will face USC Saturday, April 2, at 3 p.m. in Savage Arena. Reserved seats go on sale at 10 a.m. Thursday at the UT Ticket Office. Call 419.530.GOLD (4653). “We can’t thank you enough; our fan support — I’m blown away and humbled. You guys are amazing,” Head Coach Tricia Cullop told the crowd after the big win. “We need you back … pack this place one more time, finish out on a good note,” she added. With the win, the regular-season Mid-American Conference Champions set a new UT record with 28 victories. It was a record-setting night. Toledo posted a new MAC and UT mark for fans at a women’s basketball game with 7,020 in attendance, blowing away the previous 5,851 set at last year’s UT-BGSU matchup. And what a game they saw. 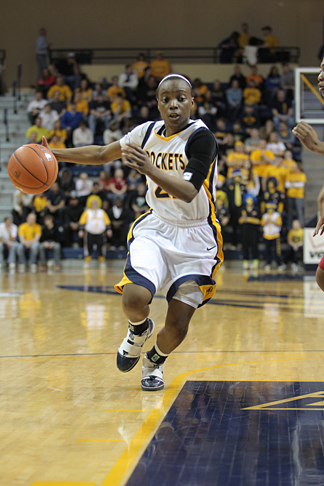 Yolanda Richardson won the opening tipoff, and Toledo scored the first nine points of the contest. And the Rockets never looked back. UT scored early, often and spread the offensive firepower around. Jessica Williams hit a three-pointer, and then Yolanda Richardson, Melissa Goodall and Naama Shafir each added a bucket for the early lead. Charlotte made it a 9-2 game at the 16:28 mark. Toledo’s lead would continue to grow. Courtney Ingersoll, Andola Dortch and Haylie Linn each chipped in two points to make it an 18-8 game. Goodall sunk another one to put the Rockets up by a dozen at the 11:59 mark. Goodall found the net from three-point land to make it 29-12 with a little more than 10 minutes left in the first half. The 49ers turned the ball over 10 times in the first 10 minutes of the half; Toledo took advantage, scoring 13 of its 29 points off those mistakes. Dortch pushed the lead to 19 points, 33-14, with just under eight minutes to play. Three minutes later, Williams hit her third trey to extend UT’s advantage to 20 points, 38-18. After Toledo went up by 23 points, Charlotte cut the lead to 20, 43-23 at halftime. It was all Rockets in the second half. Shafir drained a shot to put Toledo up by 25 points, 59-34, around the 14-minute mark. Two minutes later, Richardson popped in a couple shots to make it 65-34. Toledo would lead by as many as 34 points on the night. Five Rockets scored in double digits: Shafir with 16, Williams with 15, Richardson with 14, Dortch with 13 and Goodall with 11. Toledo burned up the net, shooting 47.9 percent from the field and 30.8 percent from beyond the three-point line. USC beat Illinois State, 63-36, to advance to the WNIT Championship game. It will be the first meeting between Toledo and Southern Cal. Dr. William McMillen, UT interim provost and executive vice president for academic affairs, laid out the eight areas he would focus on should he be appointed to the permanent position. • Establish a continuing education program. McMillen said these eight areas represent only some of what needs to be accomplished, but he wanted to highlight these specific areas as needing special attention. Asked how UT goes from good to great without further investment in academic areas, McMillen said identifying those resources is among the most difficult questions that exist. “As good as a part-time or visiting faculty member may be, they don’t replace tenured and tenure-track faculty,” he said. McMillen said UT’s strategic plan should provide the guidance for deciding where additional academic financial investment is made. He also said a discussion on faculty workload should be coupled with a faculty hiring plan. McMillen, who also serves as UT vice president for governmental relations, said his government relations experience has given him insights into how legislators see higher education as well as into the actions of the Ohio Board of Regents. Calling himself the first merged employee between The University of Toledo and the former Medical University of Ohio, McMillen said the institution is re-embracing its identity as a metropolitan research university. McMillen highlighted his past as a continuing education instructor of creative writing at UT for four years early in his career. He arrived at the Medical College of Ohio in 1982 and became the first “merged” employee in 2005 when he served as vice president of government relations for both UT and MCO. A complete list of candidates being considered for the provost position is available here, and a schedule of the open forums is available here. Gamma Theta Upsilon-Zeta Xi, the international geography honors society at The University of Toledo, has organized two lectures in April to coincide with similar sustainability events on campus. Paula Ross, a research associate with the UT Urban Affairs Center, will talk about “Rebuilding Our Local Food System” at 2 p.m. Friday, April 1, in University Hall Room 4410. “In recent years, we’ve seen a lot of activity and talk about sustainability in our communities, and two of the major topics that have been discussed are the environment and food, especially in Toledo where we have quite a few activists on local food issues. We wanted to bring those issues together,” said Leah Mullen, president of Gamma Theta Upsilon-Zeta Xi. The student group worked with the Urban Affairs Center and the Catharine S. Eberly Center for Women to organize and promote similar events leading up to Earth Day April 22. The events began with the lectures March 22 by Jonathan Bloom, author of American Wasteland: How America Throws Away Nearly Half of Its Food (And What We Can Do About It), and also have included a panel discussion with local food experts and an informational session with John Riehm of Riehm Farms of Tiffin, Ohio. Riehm is working with the Urban Affairs Center and the Clean and Alternative Energy Incubator to bring local produce to UT in the summer. For more information, contact Mullen at lmullen@rockets.utoledo.edu. With nearly $7 million already committed to University of Toledo scholarships for almost 3,500 Michigan ninth-graders across more than 20 school districts, UT is partnering with the Detroit Red Wings to let Michigan students and families know a high-quality, affordable college education lies just over the Ohio state line. Last year UT offered every Michigan school district the chance to sign up for the Scholarly Savings Account, a scholarship program that promised five annual $2,000 deposits beginning in eighth grade. To receive the accrued funds, a student must have a cumulative 3.0 GPA at the end of his or her senior year and enroll at UT. Burns said UT will more than double its current $7 million commitment this year as the students already in the program get their second $2,000 deposit and additional school districts sign up for the program. “Even if they ultimately choose not to attend UT, students are more likely to attend college somewhere if they’re taking more rigorous courses and taking academics more seriously. And they know if they keep their grades up, they’ll have $10,000 to go toward a degree at UT,” Burns said. UT is also promoting its Tower Scholar Award, which gives graduating seniors with at least a 3.0 GPA from a Michigan high school an award ranging from $9,100 to $12,000 designed to eliminate or exceed UT’s out-of-state surcharge, which is currently $9,100. Qualifying students also can combine a Tower Scholar Award and their Scholarly Savings Account. “We’re trying to let students in Michigan know that if they work hard in school, we will assist them financially to help them earn a college education. No student should be denied a college degree simply because they cannot afford it,” Burns said. School districts that would like more information on how to sign up for the Scholarly Savings Account Program can contact John Adams, UT senior director of enrollment brand strategy, at 419.530.2676 or john.adams@utoledo.edu. While reductions in state subsidy showed how Gov. John Kasich’s proposed budget would affect The University of Toledo, UT officials are working to ensure individuals are aware of proposed pension changes in the state budget. “The governor’s proposal would increase an employee’s contribution to his or her pension by 2 percent and reduce the employer’s contribution by 2 percent,” said Bill Logie, vice president for human resources and campus safety. Logie said that these changes, combined with proposed modifications by the public employee retirement fund systems, make it essential that individuals make sure they understand how the adjustments will affect them. “In February, we spread word that the struggling economic situation has led the State Teachers Retirement System (STRS) and the Ohio Public Employees Retirement System (OPERS) to recommend scaling back benefits,” Logie said. “Combined with the proposals in the governor’s proposed budget, I recommend every person in the retirement system, whether for 29 years or one year, review these proposals and understand the ways they could affect you,” he said. 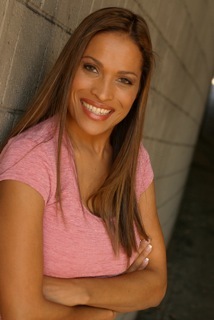 Rasheda Ali, an internationally known author and speaker, will provide her insight as a daughter of a man with Parkinson’s disease as the keynote speaker for the 14th Annual Parkinson’s Disease Symposium, “The Balancing Act of Parkinson’s Disease,” Saturday, April 2, at Parkway Place, 2592 Parkway Plaza, Maumee. Parkinson’s disease is a brain disorder that occurs when nerves of the substantia nigra in the brain die or become impaired. Those nerves produce dopamine, a chemical that allows smooth and coordinated movement of the body’s muscles. When a majority of the dopamine-producing cells are damaged, the symptoms of Parkinson’s disease appear. Some key signs of the disease include tremors, slowness of movement, rigidity and difficulty walking. In the United States, 50,000 to 60,000 new cases of Parkinson’s disease are added each year to the more than one million already diagnosed, according to the Parkinson’s Foundation of Northwest Ohio. Rasheda Ali wrote the book, I’ll Hold Your Hand So You Won’t Fall: A Child’s Guide to Parkinson’s Disease, after watching the interaction her children have with her father. In contrast to when she was a child and her father’s symptoms were subtle, Rasheda’s children see the visible signs of Parkinson’s disease in their grandfather. Muhammad Ali, a three-time World Heavyweight Champion and Olympic gold medal boxer, was diagnosed with Parkinson’s disease in 1984 at age 42. Rasheda Ali will discuss coping with a neurological condition and how it affects the family unit. Her message is partnership, love and support to strengthen the family and bring members closer together. “All the people here are excited to hear her message of hope. She will really inspire people,” said Dr. Lawrence Elmer, UT professor of neurology and director of the Center of Neurological Health. The annual symposium is held to benefit patients with Parkinson’s disease, their families and the community with up-to-date information, research and treatment. The symposium attracts up to 600 attendees each year, Elmer said. The symposium also will include remarks from Dr. Krishe Menezes, UT assistant professor of neurology, who will discuss the latest in deep brain stimulation as a treatment for Parkinson’s disease. Dr. Michelle Masterson, chair of the UT Department of Rehabilitation Sciences and associate professor and director of the Physical Therapy Program, along with Dr. Selena Nicholas-Bublick, UT assistant professor of neurology, will discuss intimacy issues to promote better relationships. Doors at Parkway Place will open at 8 a.m. with the welcome and introductions beginning at 9 a.m. Rasheda Ali is expected to address the crowd at 11 a.m., following the morning speeches about deep brain stimulation and intimacy. A lunch, raffle and panel discussion will round out the event, which is scheduled to end at 3 p.m. The annual symposium is co-sponsored by the Parkinson Foundation of Northwest Ohio and the UT Medical Center Parkinson’s Disease and Movement Disorders Program. 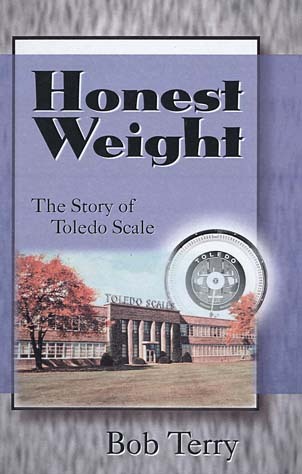 Bob Terry, author of Honest Weight: The Story of Toledo Scale, will talk about the history of that Glass City icon Wednesday, March 30, at 3 p.m. in the Ward M. Canaday Center for Special Collections in Carlson Library at The University of Toledo. Terry, who worked as advertising manager for Toledo Scale and later for Mettler Toledo after the company merged and move to Columbus, published his history in 2000. The book tells the story of how Toledo Scale was founded in 1898 by Allen DeVilbiss Jr. as the DeVilbiss Computing Scale Co. DeVilbiss developed a scale that was more accurate than other scales available at the time. Rather than depend on springs, DeVilbiss’ scale employed a pendulum that used gravity to compute weight measurements. In 1901, the company was purchased by Henry Theobald, who developed the slogan “No Springs, Honest Weight” as a way to market the company’s technical advantage over other types of scales. Toledo Scale became an international company, and in many parts of the world, the name “Toledo” became synonymous with a dependable and accurate instrument of measurement. The company spread the city’s name around the globe. The free, public exhibit is on display Monday through Friday from 8:30 a.m. to 5 p.m. through Friday, Aug. 12. Two more talks related to the exhibit will take place next month. Bill Hamilton, a writer and media consultant who is the retired media relations leader of Owens Corning, will speak about the company Wednesday, April 6, and local historian Marjorie Waterfield will give a lecture about the history of the DeVilbiss Co. perfumizers Wednesday, April 13. The series of talks and the exhibition are made possible in part by a grant from the Ohio Humanities Council, a state affiliate of the National Endowment for the Humanities. For more information on the lecture and the exhibit, contact the Canaday Center at 419.530.4480. The Satellites Auxiliary will hold its spring book fair in the Skyview Food Court Atrium Wednesday through Friday, March 30-April 1. The sale will run from 7 a.m. to 6 p.m. Wednesday, from 5 a.m. to 6 p.m. Thursday, and from 7 a.m. to 4 p.m. Friday. A portion of the proceeds will benefit scholarship funds. The Satellites Auxiliary is a group designed to promote education, research and service programs, provide support of patient programs in accordance with the needs and approval of administration, conduct fundraising events, and provide volunteer services. See fruit in a whole new way with an interactive app created by The University of Toledo. Fruit Expos3D provides real X-ray computed tomography imagery of 25 different pieces of fruit with detailed 0.5-millimeter CT scan slices that highlight the density of the objects. The app, created by the UT Center for Creative Instruction in conjunction with the Radiology Department, gives users the options to “explore” an apple, banana, star fruit, blueberries and more with a video that rotates the three-dimension image as it cuts through the layers to explore the fruit in extreme detail. There also are fun facts to learn about each piece of fruit. For example, did you know that an apple is a member of the rose family? Or that there are more than 3,000 known varieties of pears in the world? 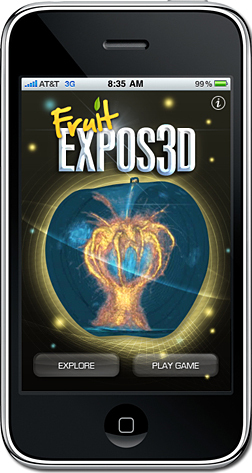 The “Play Game” feature allows you to test your hand at identifying each fruit from the “exposed” image. A correct answer on the first try earns 100 points, with clues to help you on your second guess, as for example, “Hey Einstein, what kind of fuzzy logic are you using?” to point you in the right direction of peach. The Center for Creative Instruction has extensive experience in developing educational content using a variety of imaging techniques and multimedia. This product was a natural extension of the work that has been done previously using CT images of human anatomy. The Center for Creative Instruction has developed numerous mobile applications over the years; however, this is the first one for sale in both the Android Market and iTunes store.